For those who have ever enjoyed a lobster dinner at a fancy restaurant, they probably offered clarified butter, but what exactly is that? 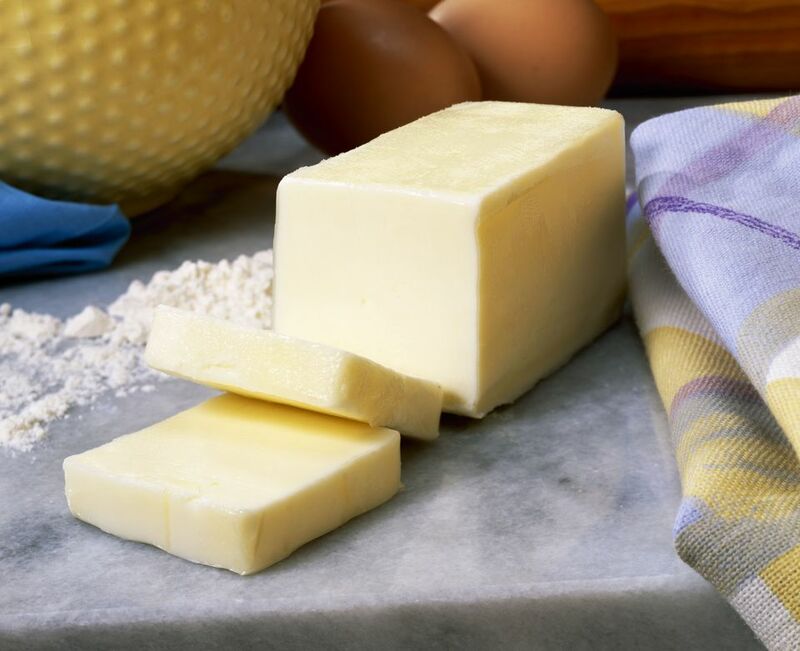 Whole butter is made up of three things: fat, percent water, and milk proteins. Clarified butter is the translucent golden-yellow butterfat left over after the milk proteins and water are removed from whole butter. There are a couple of reasons for doing this. For one thing, clarified butter is great for sautéing because it doesn't burn as easily as ordinary butter. It's the milk proteins that cause the butter to smoke; since clarified butter no longer contains those, it can be cooked at hotter temperatures. Ordinary butter will start to smoke at around 350 F, while clarified butter can be heated to at least 450 F before it reaches its smoke point. It also has a longer shelf life than whole butter—again because the milk proteins can spoil. Making clarified butter is pretty easy. To begin, gently melt a stick or two of unsalted butter in a heavy-bottomed saucepan over low heat. As the butter melts, you'll see a layer of foam rising to the surface. The bubbles are the butter's water content boiling off and the white residue is the milk proteins separating out from the butterfat and water. If you've ever cooked milk too long and had it curdle, it's the same thing. Curdling happens when the milk solids break away from the emulsion, either because of heat or the introduction of an acidic ingredient like lemon juice. As the butter continues to simmer, use a ladle to skim the foam and milk proteins from the surface of the liquefied butter. Note the clear, golden liquid underneath the foamy residue. This is different from the technique for making ghee, in which the milk solids are allowed to settle to the bottom and turn slightly brown. That adds a nutty flavor to the ghee, which isn't bad, but it's not what you want for clarified butter. Keep a separate bowl for the buttery, foamy milk solids that are skimmed off because it can be used to coat other foods. (For one thing, it's fantastic on popcorn.) It can also be added to mashed potatoes or served over cooked vegetables and fish, even pancakes, waffles, and the like. In a few minutes, most of the milk solids will have been skimmed off, leaving just the pure, yellow butterfat. Another use for clarified butter is making sauces, especially butter-based emulsified sauces like Hollandaise and béarnaise. The water in ordinary butter can destabilize the emulsion and cause it to break. Since its water content has been removed, clarified butter eliminates this problem. 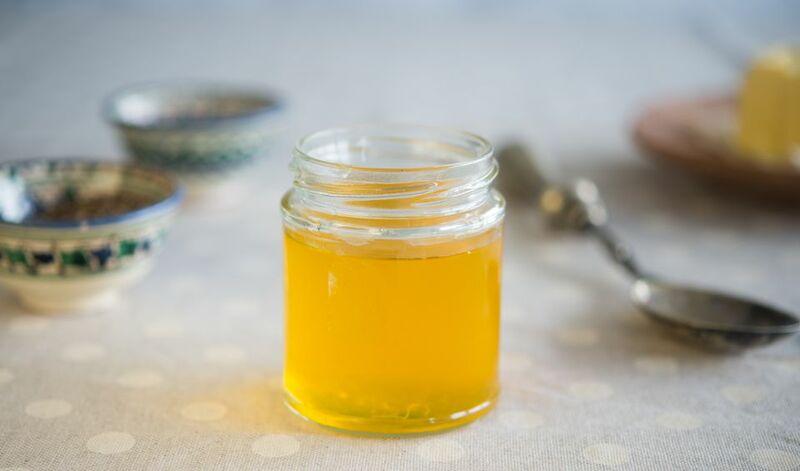 Clarified butter doesn't spoil as easily as ordinary butter, so it can be kept for quite a long time. While it can be stored at room temperature, a cool place is best, so definitely don't keep it right next to the stove. For best results, store it in an opaque container with a tight-fitting lid, since prolonged exposure to light and oxygen can cause fats to become rancid.